Like a dowager with her jewels, Buffalo adorned herself with notable buildings during the economic boom of the late 19th century. Among the gems is the Bank of Buffalo Building, the creation of R.W. Gibson, an Englishman trained at the Royal Academy. Gibson rose to prominence in America with his winning design for the Episcopal Cathedral in Albany (1884). style, suggestive of the age of faith, is appropriate for the cathedral, so, too, the Renaissance revival style gives special meaning to the bank. The revival style, beloved of the beaux-arts movement then sweeping Europe and America, not only suggests stability and growth but also recalls the rise of banking in Renaissance Italy and the emergence of the modern world. The Columbian Exposition at Chicago in 1893 gave impetus to the spread of Renaissance forms in America. Gibson was well prepared to take up the call. 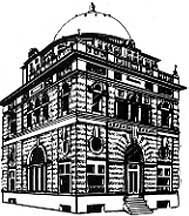 In his design for the Bank of Buffalo, Gibson repeated elements found in his earlier Greenwich Savings Bank, N.Y.C. (1892) namely the dome, the contrast of rusticated (see glossary below) and ashlared stonework, and the combination of arcuated and trabeated forms. The popularity of the new style caused Gibson to repeat his formula a number of times. He successfully gave each resulting bank building its own "personality." The Bank of Buffalo, although disfigured today by a veneer covering pant of the original stonework, has a dignified air. The original organization of the facades is known from early photographs. Piers anticipate the three bays of each facade. Bold horizontals - the raised basement, water table, string courses, attic story, balustrade, and, perhaps most importantly, the layering of rusticated and ashlared stonework - play against vertical forms. Overhead, atop an octagonal, terra-cotta drum, rises the hemispherical dome. Its original patterned surface once echoed the highly varied textures below. The arched entrance with its elongated voussoirs and ornamental keystone, as well as the Serliana flanked by carved reliefs on the upper story, distinguish the principal Main Street facade. The Seneca Street facade is scarcely less opulent, with a large arched window in the central bay surmounted by a trio of smaller windows. The treatment of all the flanking bays is identical. Each has a stack of windows - rectilinear at the basement and first story, bull's eye with pronounced keystone on the mezzanine, and arched in the upper story. A fourth bay, constructed of metal, on Seneca Street repeats the ground-story window at all levels. The over-all effect is ceremonious and stately. The interior has also been modified. The Illustrated Buffalo News, April 1, 1894, provides a description of Gibson's design. The main banking room "is practically two stories high and is lighted from the central dome, the skylight being about 20 feet across. The counter screens are of marble and bronze and the floor is a tile mosaic . . . At the left is the president's room, adjoined by the offices of the cashier and the assistant cashier . . . "
The building was modern and functional in its careful utilization of varied spaces. It was equipped with vaults, lunch rooms and an electric elevator; and, from the time it was built, it had electric lights and fans and steam heat. Though promised, protective scaffolding around the dome was not erected during the recent demolition (1986) of the adjacent Chamber of Commerce Building. The Bank of Buffalo Building has suffered serious and inexcusable damage. The sheathing of the dome is in tatters, the framework is bent, and the terra-cotta skin of the drum is broken. Does such disregard forebode the plucking of yet another jewel from the the city's bosom? With thanks to Cornelia Brooke Gilder for material on the career of Robert W. Gibson. Keystone The wedge-shaped piece at the crown of an arc that locks the other pieces in place. Rusticated Having a rustic appearance because of the use of rough, naturalistic blocks. Serliana A tripartite window arched at the center and rectangular at the sides, associated with the Renaissance architect Serlio. Trabeated Designed or constructed of horizontal beams or lintels. Voussoir One of the wedge-shaped pieces forming an arch or vault.